Installing the Enterprise part of Provision Mangement Framework (PMF) can be divided in several parts. The first part is installing the Enterprise products on the Terminal Servers. This is done in exactly the same way as installing the standard framework by choosing the components, you would like to install. If needed another installation path can be specified. Silent installation of the terminal server components is possible using Orca and creating your own MSI file. The load manager can be installed on any Windows server you like. In this way you can choose to install the component on the Terminal Server(s), File server(s) or dedicated server(s). Web-IT is installed on a IIS server with ASP.Net enabled. 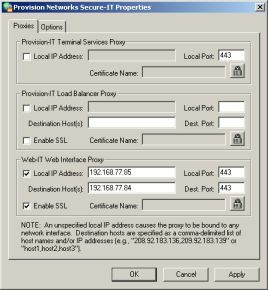 Secure-IT and Proxy-IT can be installed on any Windows server you like, depending on the scenario you are implementing. For all components the installation exists of selecting the needed component(s) and choosing the installation path. Silently install of these component is also possible again using Orca for creating a MSI file. 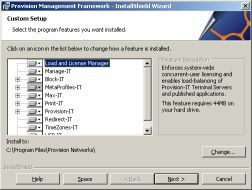 After installation you need to start the Provision Management Console. When the console starts the first time you need to make a DSN file to your database server. After the first installation the database is also created in the same way by specifying a SA account for that SQL or MSDE server for creating the database and the user for connecting to the database normally. As described above the standard edition is extended with some features so Provision Management Framework (PMF) becomes a SBC supplier. The Enterprise products competes with players like GoGlobal, Tarantella, HOBLink and of course Citrix. Using the RDP protocol PMF offers Application Publishing, Seamless Windows, Load Balancing and credentials pass-through. Via Web-IT, Secure-IT and Proxy-IT Provision extends the possibilities to connect to the Terminal Server environment. Load Balancing within PFM is called Workload Evaluators. Within this component you can load balancing the sessions over the PMF servers. Within the workload evaluator there is one default evaluator, but you add as many as you like. Each evaluator can be linked to a server or application (if both have an evaluator application take precedence). The Citrix load evaluator has the most configurable counters of all SBC products. Although PFM has not all counters, which Citrix has, it is getting close. The most used evaluator "Number of Users" is available within PFM (most other products do not have this counter) and other useful evaluators like CPU load, Disk load, Memory load and more. The Load Management part can be installed on two servers for fault tolerance (by adding the server within the Management console). Standard TCP port is 80, but can be changed if necessary, also SSL encryption is supported. To accomplish this Provision has developed his own client software. After installing the Provision-IT client two flavors are available. An so called AppPortal and a redesigned Microsoft RDP Client. To this redesigned Microsoft RDP client Provision added additional features like auto creating USB handhelds, universal printers and smartcards. When configuring a default application this can be started seamless. The AppPortal is the full Provision client. Using this client Published Applications can be presented to the end-user. Also credential pass-through can be enabled. The configuration can be loaded automatically via an URL. It is pity the Main Windows of the client is always on top and the configuration screens appear behind this main window. 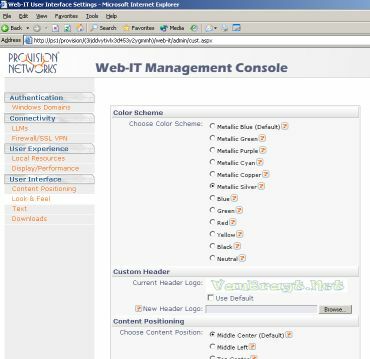 Web-IT is the web based version of the Provision IT client. Via a website the published applications are presented to the users. If you take a look at the administrative website of Web-IT you find almost all options which are also available within Citrix Web Interface. There are possibilities to configure more domains, hide the domain name, connecting with the Load Manager, SSL connection (via Secure-IT), auto created local resources, look and feel, etcetera. A very good option is the text option. Within this option you can change the text displayed to the users. With Secure-IT RDP traffic can be encapsulated within SSL. It you again compare it with Citrix it is the equivalent of Citrix Secure Gateway. Secure-IT can be used directly via a Provision IT client (configure the Load Balancing only) or with the Web-IT component (just like the combination of Citrix WI and Secure Gateway). These options are available within the control panel of the Secure-IT server. Using Microsoft Network Load Balancing it is possible to create a fault tolerant solution. The Enterprise options are available using the Provision IT client, which is available only on the Win32 platform. To provide other platforms with this functionality Proxy-IT is available. Using Proxy IT any RDP client can connect via Proxy-IT to the Provision platform with the enhanced functionality of Load Balancing and Published Applications. The only configuration needed is the fill in the Load Balancing servers on the Proxy-IT server and let the RDP client connect to the Proxy-IT server. Of course all three products can be placed in DMZ environments. Most components have an option to save a trace log to a text file. Using this file you can troubleshoot on the information provided in this file. It would be nice if the monitoring options of the product can be extended. With the Enterprise version Provision the Framework becomes a complete SBC product by adding pure additional Terminal Server functionality like Seamless Windows, Load Balancing, Session sharing and pass-through credentials. With Web-IT, Secure-IT and Proxy-IT Provision provides nice opportunities to give users access to the Provision Farm from any client. If you only take a look at the Enterprise components Provision is already offering comparative functionality as their direct competitors. However Provision is giving you much more. All component described in the review of the standard edition are also available within the enterprise edition. Lot of these components are not available in the products of the competitors and need to purchased separately by other third party manufacturers. Logical these components are not offering the same functionality as some special third party product, but in much situations Provision's functionality is good enough. These Enterprise components are, unlike the standard edition, good documented in the administrators guide.